Vintage Master Class With Prof. Brigitte // 50s 60s Hair! Greetings from sunny Hawaii!!! Oh we are having such a fantastic time friends. I can’t wait to share some photos with you when I get back. Until then I have lined up some really terrific Guest Posters to round out the week. Today I have a really special treat for you all. 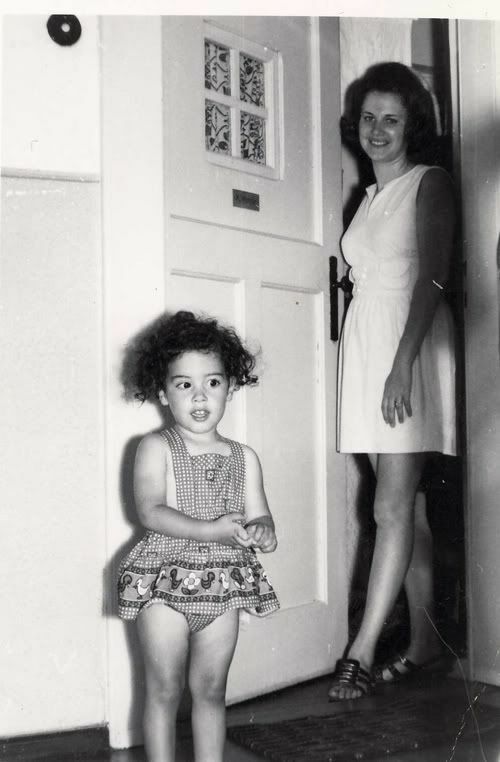 Our Guest Poster is none other than my own personal style icon…my mom, Brigitte! Yep it’s me and my mama. My mother has always been very stylish and taught me everything I know. Back in the 70s when most of the moms around my elementary school wore double knit, polyester stretch pants, I was extremely proud to have a “pretty mom”. Even though we weren’t particularly wealthy, my mother always looked like a million bucks. 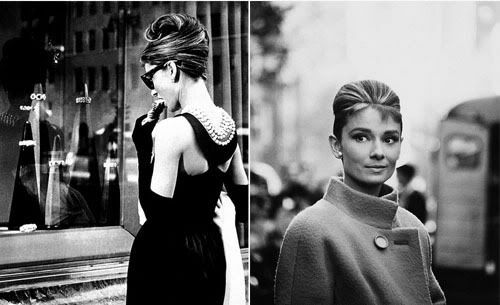 In addition to a fabulous wardrobe, she always had fabulous hair. This post started as a great email exchange and I asked her if she would mind if I shared it with you. I know you all love vintage as much as I do, so I thought who better to tell us about it than someone who actually lived it! Presenting the Vintage Master Class with Professor Brigitte! Yes, its true! 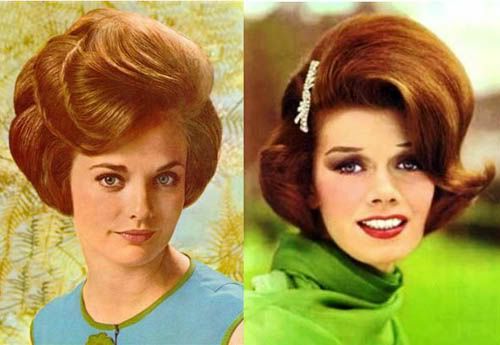 My generation shared an obsession with our hair. When I think of all the styles we had it makes me smile—we went from one extreme to the other! 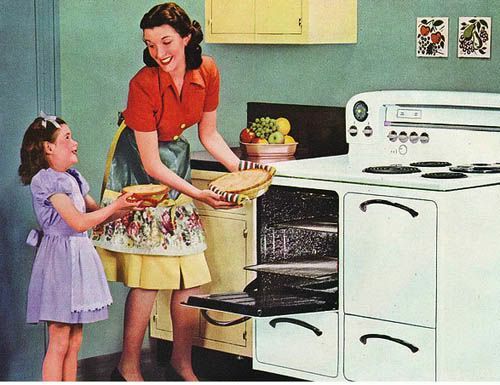 We were raised by the 1950s, apron-wearing, ‘pincurl’ ladies. Charming to you guys, but keep in mind this was a style we never embraced, and in fact rebelled against! 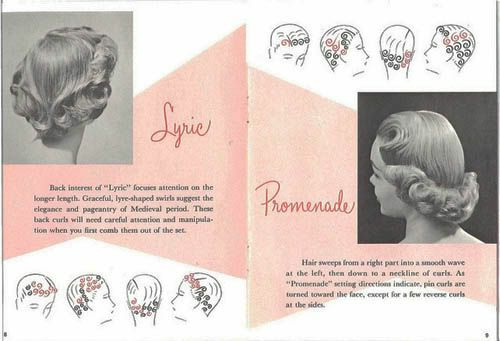 Instructions for pin curls was rather simple. Take a strand of hair, wind it around your forefinger, then press down onto your head and fasten with two bobbypins criss-crossed. Repeat all over your head! 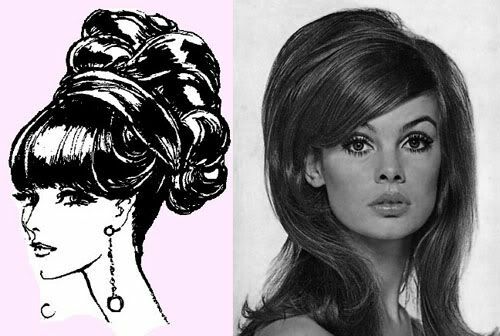 Removing the pin curls you brushed your hair flat against your head, with just a little halo of curl around the bottom—and soft waves on the side. By the time we reached Middle School, we had found our niche. Our hair was as flat as our skirts were wide! To achieve this full-skirt look, we wore a scratchy, netting-like petticoat. I always felt mine were never quite as full as they should be, until one day I discovered that you needed to wear TWO petticoats for the proper look. Only then would you have the tiny waist and wide, full skirt! It looked terrific but was a bit hindering if you wanted to walk faster than a Geisha. Still we loved it. 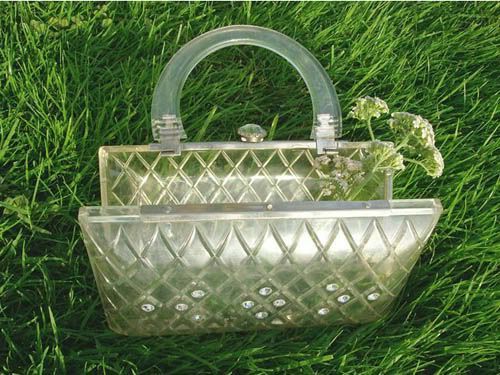 To complete the look you wore flat ballerina slippers and our personal joy—the plexiglass purse. These were see-through, hard plastic handbags which exposed all your contents. To remedy this, you had your little neck scarf which could serve two functions: wear around your neck OR line your purse. Even better? Match the color with your sweater or dress! By high school days, a new dramatic change was upon us! Hair was not flat anymore. Oh no, hair was getting taller! How to achieve the glorious mountain of hair built high upon your head? It was quite a process. First you started using rollers/curlers. 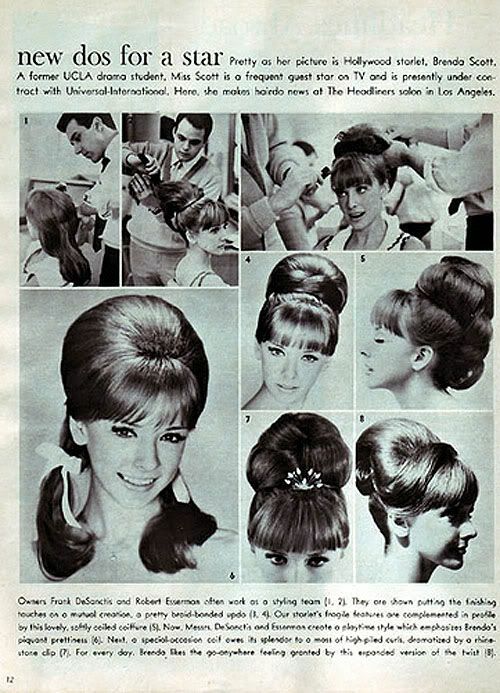 This was a task because in those days there were no soft spongy ones (or hot rollers!). 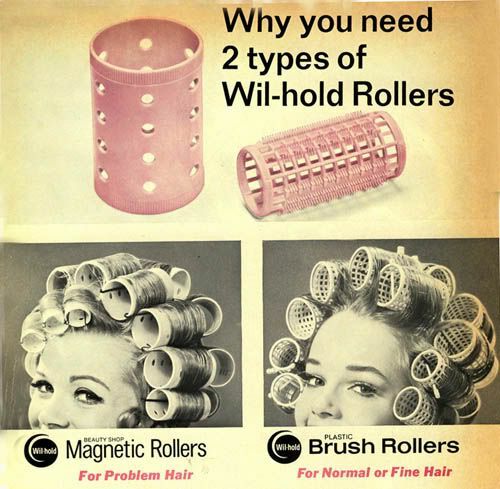 Our rollers were like a mini hair brush, complete with bristles, to hold them firmly on your head. An extra hairnet was also a useful tool to keep the curlers in place. You’d press them down good and hard into your scalp right before bedtime. Yes, girlies, you heard right. We slept with bristly hair rollers on our head! It was torturous, but slowly our scalps got used to it, and we were saved by the youthful ability to fall into a deep sleep. You really wanted to get your hair as big as possible and sometimes rollers just weren’t enough. To meet this new demand we were informed about the latest hair rage: “teasing” (or back combing). Teasing became the secret foundation to all our extravagant styles! We learned and observed from our hairdresser, who opened up this whole new world to us. Instructions on how to tease hair (tease was a strange description of this painful activity!) were as follows: take a strand of hair, pull it taught and with your comb, push down backwards to the root! Do it slowly and carefully, to achieve a good matted result. The longer your hair, the longer this took. Painful? A bit! But remember our scalps had been toughened by the bristle rollers! This style was vulnerable when it came to the weather. Rain, snow or fog were lethal to your mounted up hair. And there was nothing worse than a drooping hair do. Flat?? Horror!! Downright ugly. We got up early to achieve this look and we were devastated when bad weather threatened to droop our ‘do. Before school we crowded into the girl’s bathroom, equipped with our trust trio—comb, spray and mirror—to pull our sunken locks back up to their towering glory. 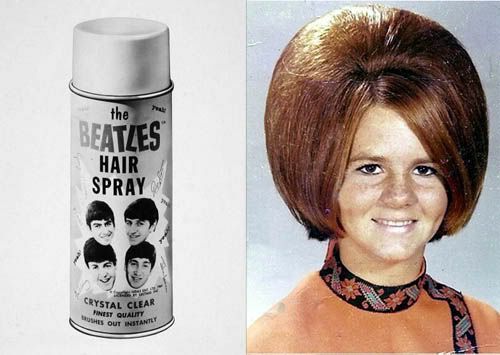 Our bathrooms were not clouded up by cigarette smoke, but by a barrage of hairspray use! Of course, at this time the unthinkable began to happen. As our hair got higher the lengths of our skirts got shorter! The short hemlines remained but as quickly as the ‘backcombing’ turned up, it quickly disappeared. Can you blame us? It simply was too much work. Soon a new phenomena developed! Up til now the only way to change your hair color was by going to your hairdresser. This all changed, when they “do-it-yourselfers” hit the market. My girlfriend Charleen became an expert on coloring her own hair. An achievement that we all admired. We were just getting used to the idea that you could dye your hair yourself when a new trend arrived on the scene. We began to notice that some celebrities kept their natural hair color, but had streaks of blonde throughout. How did they do this?? We were highly intriged. We checked with our hairdressers, who told us that the secret was something called frosting. Now I must brag! i was of the first in my crowd, who made her appointment for a ‘frosting’ job. Encouraged by my girlfriends, I was brave enough to venture into the unknown. When my hairdresser showed me the Frosting Cap, I still had no idea what i was in for! Instructions: first take a tight fitting rubber cap, similar to a 50’s bathing cap, which had loads of little holes in it. Put cap on, tucking in all hair carefully. Then with a little metal crocheting needle pull pieces of hair through the opening holes, one at a time. Pulling your hair through those little holes easily took 2 hours, depending on the lenghth of your hair. Once this was completely, you out hair dye all over the pulled bits and sat under the dryer. My hair was shoulder length and it was one of the most painful procedures I had ever done on my head!! And here I thought my bristley curlers had toughened up my scalp! Equally painful was the removal, which took just as long as the first act. Your hair strands were carefully pushed back in through the holes onto your scalp. Another 2 hours! When I finally walked out, my scalp was raw. I barely glanced in the mirros— I had no interest in how I looked. I rushed home to put my sore head on my pillow and CRIED! The next day I felt better and for the first time I actually showed interest in the outcome of my torturous afternoon. Wow, it really was nice! I was ready to make my triumphant entrance to the school cafeteria at my Junior College. My girlfriends rushed towards me, circling me and oohing and ahhing about how wonderful my hair looked. My spirit lifted a bit after that. My friends were full of questions, as to how it went, how long it took—and all were eager to go and have it done! One by one we all had frosted hair, and no one admitted to the pain we endured! I admit I was a bit wary, but I started thinking that at least with Charleen I could always put a stop to the whole thing if I had enough of the torture. So one Saturday morning, I went over to Charleen’s house. She had set up her own room like a mini salon. It looked great and I was beginning to get into the spirit. This might be fun after all! Charleen opened up the box of frosting dye, and to our surprise, the instructions said: must provide your own frosting cap! Hmm. After a bit of thought, Charleen declared any plastic bag would do! Delighted not to have to wear a skin tight cap, I readily agreed. It was beginning to sound like it wouldn’t be that painful at all! Charleen tied the plastic bag around my head holding it down with clips, and then cut slits into the plastic all over. I have to say it looked very professional. Soon the job was done, took only 40 minutes, because the hair came out so easily and wasn’t painful at all. She brought out her timer, and we sat , gossiped, had some chips and waited in anticipation. How fun! When Charleen was done washing it all out in her bathroom sink, she had a funny look on her face. What? What is it? I asked nervously. I knew that sheepish look! She held up a mirror, and I screamed. I was completely bleached blonde. Charleene’s mother came rushing in, and had a combined look of shock and amusement. “Our own Marilyn Monroe!” I wasn’t amused. So what had happened? The hair coloring was too heavy for the plastic bag, and had widened the slits completely so that the dye seeped all over and every hair on my head was bleached. Despite the calamity, Charleene now was in her element. She drove to the drugstore (I wouldn’t leave the house!) and bought a darker dye that was more of a medium blonde She expertly applied it to my hair, and I had to admit, that it looked pretty darn good. Ironically, I’ve remained a blonde ever since. To everyone’s relief, Charleen decided against becoming a professional hairdresser and become a dentist just like her father. So that’s the end of this edition of your Vintage Master Class….but our story doesn’t end here, we still have the rest of the 60s and 70s to cover! Thank you for having me over here as a guest on Modern Kiddo! Um, how awesome was that? What do you say, shall we make the Vintage Master Class a regular feature?? Part 2 on Hair Dos is already in the the works! Thank you mama for guesting while I’m on vacation! Posted in Mama Style, Vintage Master Class. Love this post. I had forgotten about all the hair torturing history. My mum used to do the frosting. I remember her using a crochet hook to try and pull strands of her short hair through the rubber cap. Unfortunately I also remember the cap split slightly and she had beautiful highlights all over except for one spot where there was a very large blonde patch where it had leaked. My sister and I were more of the hair straightening generation. Being very fuzzy haired girls our mother showed us how to iron our hair with the standard house iron. The trick was to get as tight to the scalp as you could without burning. I’ve never used anything that got my hair straighter than the plain old iron. oh … words can not express how much i ADORE this post!!! This was such a fun post to read! Can’t wait to see the next one! this is my fave post ever. i once put comb rollers in my hair at the hairdressers while my mom got her’s done and they got stuck in there. it was pretty horrifying. this is SO awesome. I can see where you get your quick wit from, Alex! What a doll your Mom is! Hope you’re having fun in Hawaii! you look so much like your mother! and the baby you still looks so much like the modern day you. one of the stories i still remember about my grandma was the whole going to the beauty salon/parlor once a week (as late as the 70s, i suppose) and sleeping with toilet paper around her head. i think that’s the only time i had heard that and thought it sounded completely insane. i’ve actually seen some stylists STILL using those caps for highlights! those things are awful looking. Beth, my Mom still has a weekly beauty parlor appointment, but then again, she can’t do her hair. Like AT ALL! Why does it not surprise me that Alix’s mom would be just as great a writer as Alix? Now I know where Alix’s love of fabulous hair styles and clothes come from. 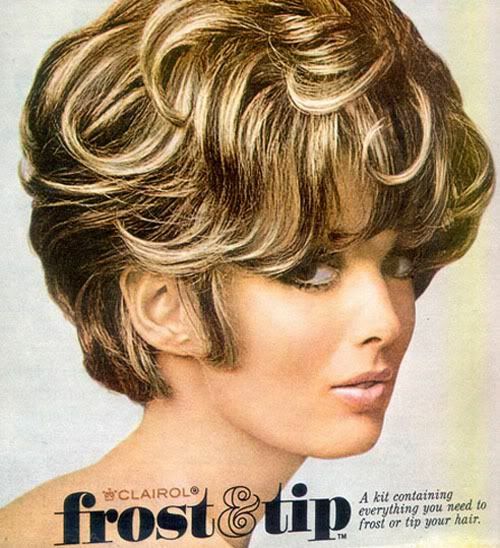 I remember my mom using “Frost n Tip” to this day my dad always requests that she “frost” her hair! I would LOVE to see this as a regular feature! This is one of my all-time favorite posts I have ever read on any blog. 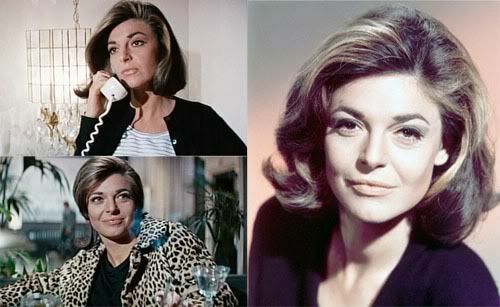 Brigitte sounds like an awesome lady (not surprising though, just look at Alix)! this is the most fabulous thing ever. i am going to forward this post to MY MOM who was a stylist for 20+ years!!! so fantastic to hear from mama Brigitte!!!!! and i agree with the others, MORE, MORE! more from Brigitte! i forgot to mention just HOW MUCH I LOVE THAT LITTLE GINGHAM BIRD ROMPER on wee alix! AH! dreamy. I was just about to write that, Jenny! Hee hee! So cute! LOOOOOOOOOOOVE!!!! I want frosted tips now! Thank you everyone! I’m so glad you liked!! This is so wonderful! I love it. Can’t wait for the next one as well. I remember frosting my hair when frosting made a brief comeback about 10 years ago. I was as painful as was described here! Yes! Yes! Make it a regular feature. This was such an awesome post! I love this! Thank you, Dame Momma Brigitte! Really marvelous post! I love reading about ‘hair torture techniques’ of the 60’s and 70’s. They really knew how to make a woman look glamorous back then.